The single or multiple itinerary deviation feature in the TravelHerd FIT booking engine allows for a passenger or multiple passengers to deviate from the main itinerary for their own specific activities while staying within the overall main itinerary framework, within a single reservation. Itineraries using this feature show the main itinerary with the deviations, tagged with their specific travelers names, as they occur. The single or multiple itinerary deviation feature is particularly useful for reservations with multiple passengers traveling together for most of their journey. Naturally, it is beneficial for both the travel agent or direct consumer who made the reservation to maintain all passengers within a single reservation. A single itinerary and invoice is preferred but when itinerary deviations occur can this be done? For tour operators using TravelHerd, the answer is “Yes!” Not only can you keep all the passengers within a single reservation but you can detail any and all deviations from the main itinerary by passenger on the actual days they occur within the main itinerary. 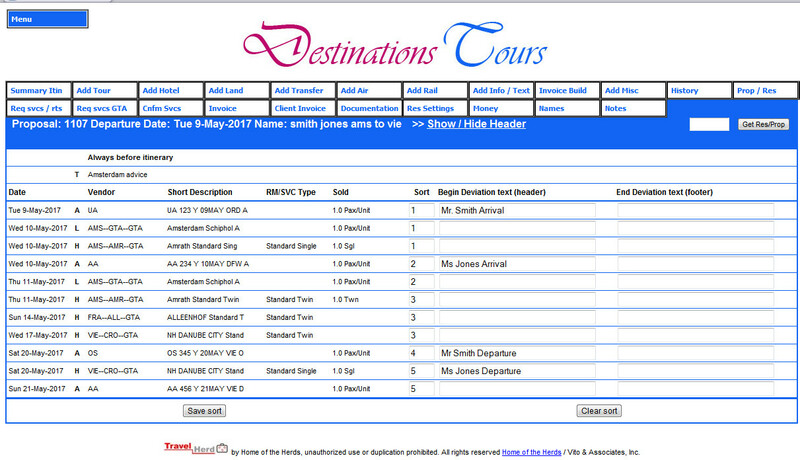 Use the Deviations tab and group the components to be shown together on the itinerary sorting by group within the itinerary; you can add optional deviation headers and footers which will appear on the itinerary and the reservation summary.